Tortola is the largest island in the British Virgin Islands, a chain of over 60 islands, most of them small and uninhabited, although accessible for easy day trips by charter boat. Located 50 miles east of Puerto Rico, Tortola is a mountainous island with excellent beaches, beautiful snorkeling and dozens of excellent diving locations within easy reach (Long Bay Beach starting at the end of our driveway). The BVI is a Dependent Territory of Britain with self-governing status. While the island is largely autonomous, it does have a formal Governor appointed from Britain, who's very nice and whose daughter my sister and I learned to surf with in 2004. 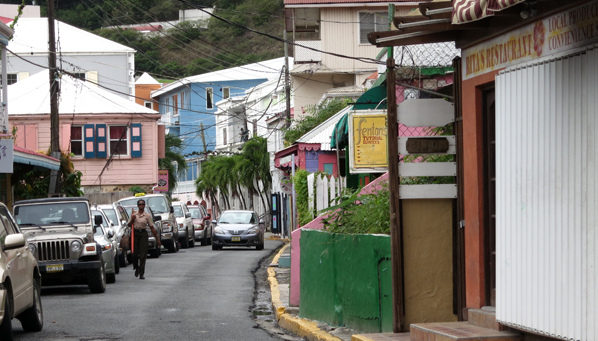 Tortola itself has about 14,000 inhabitants and the people are very friendly. One important aspect of the island is that, unlike some islands, such as Jamaica, the tourism industry is controlled by natives, so the local people have a vested interest in you having a good (and safe) time. The BVI has a colorful history and was notorious for the pirates attracted to its secluded coves, hidden reefs, and small satellite islands. While the pirates have been relegated to Disneyworld, they are remembered in the names of many of the islands, beaches and coves. Smuggler's Cove and Thatch Island (named after Edward Thatch/Teach, more popularly known as Blackbeard) are two well-known examples. The currency of the BVI is the dollar. Major credit cards and traveler's checks are also widely accepted. You will need a passport to enter the BVI. 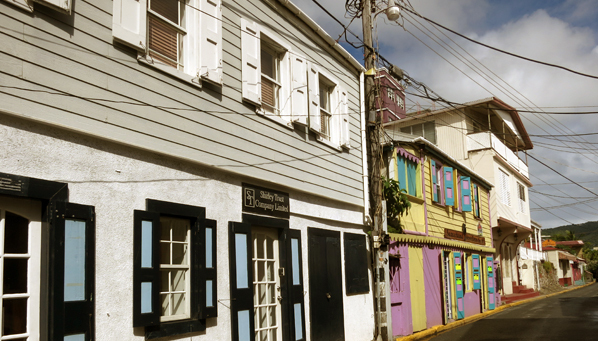 We are about 8 miles from Road Town, the main town (and capital of the BVI) that has some interesting shops and several good grocery stores. Waterfront Drive is the largest tourist area in Road Town, with shopping and some nice restaurants right on the waterside of the harbor. Main Street is the original center of town, a small one-way street with colorful small shops. 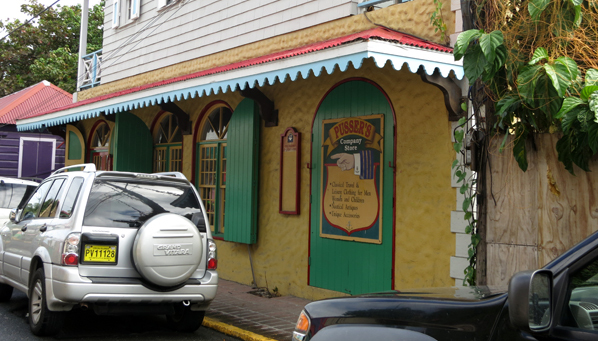 The Culinary Institute&apos;s bakery (highly recommended) and Sunny Caribbee (a good spice shop) are both located on Main street, as is a Pusser&apos;s if you need to stop for a drink. If it&apos;s hot, and it usually is, be sure to stop by La Dolce Vita, the gelatto shop located in the center of town. One can also buy groceries at a new superette, Big Ben&apos;s, on the other side of Zion Hill from us (1 mile but hill is steep so think car rather than walking unless you are really fit), at Ample Hamper at Soper&apos;s Hole near West End (2 ½ miles and expensive but good) or at Nanny Cay (5 miles). There is free wifi at Ewing House, so you can get internet access directly at the house. This information is for if you are traveling around the island during the day. 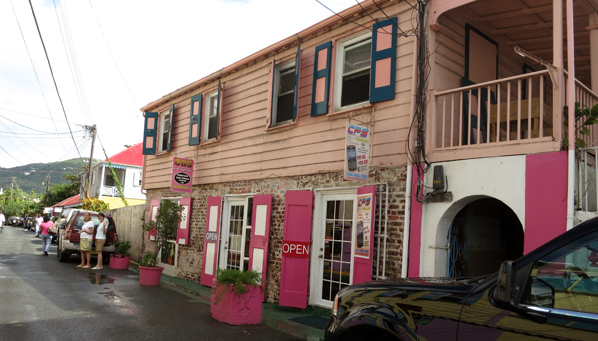 There are a number of Internet cafes (frequently located within other businesses, but open to the public) on the island, although prices vary significantly. Nanny Cay has very nice internet access through the marina management office (and it&apos;s open every day, including holidays). It also has nice volume pricing. Soper&apos;s hole has internet access inside the jewelry shop. Road Town has a number of internet cafes if you&apos;re already going into town. If you&apos;re in Cane Garden Bay, Myett&apos;s, one of the beach bars, has internet access as well.